Travel to the snowcapped mountains of the northwest United States for a once in a lifetime opportunity to catch a glimpse of a roaming wolf pack. Click here to play! Spin these majestic creatures for a chance to bring in some substantial slot winnings. Start off your search for these wild canines by finding their tracks in the snow. These icy prints are an important symbol as they are a scatter. Not only will they multiply your total bet, but they will also trigger a number of free spins if you collect three or more of them anywhere on the board. They’re sure to lead you to the pack. Spy the howling wolf to get a top payout worth up to 1,000 times your line bet. It’s also a wild symbol, which means it will substitute for most others to help you create more wins. 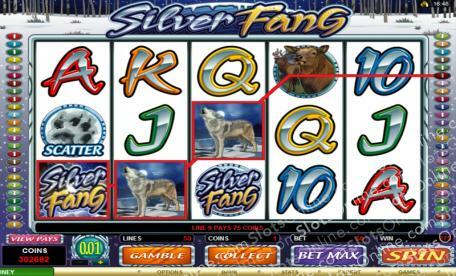 Other symbols include the Silver Fang logo, which brings in up to 750 times your line bet. The wolf face symbol will bring in up to 500 times your line bet. Finally, the elk symbol will bring in up to 250 times your line bet. Spin the reels to catch a glimpse of this illusive roaming pack and you are sure to bring in plenty of big money wins! The wolf track in the snow is a scatter. If you spin three or more of these symbols anywhere on the board you will multiply your total bet by 5, 20, or 50 respectively. Three or more of these symbols anywhere will also trigger 15 free spins with a 5 times multiiplier. The howling wolf is a wild. It will replace all others, excluding scatters, to help you create more winning lines. It will also payout up to 1,000 times your line bet if you spin two to five of them on any active payline.